MPEG is one of the most popular formats for video, and it’s easy to see why. MPEG files have a high level of compression, yet retain very good quality, so converting large files to MPEG significantly reduces the size of the files. So now you know what to do if you have a great film collection and want to save it, but don’t have sufficient hard disk space available. Just convert your favorite movies to MPEG first! To do this, use Movavi Video Converter. This software is not just a good MPEG-1 converter, but a powerful tool to manage your multimedia files. Convert them between more than 180 formats and save for more than 200 gadgets. Download the Windows or Mac version of the program and follow the guide below. 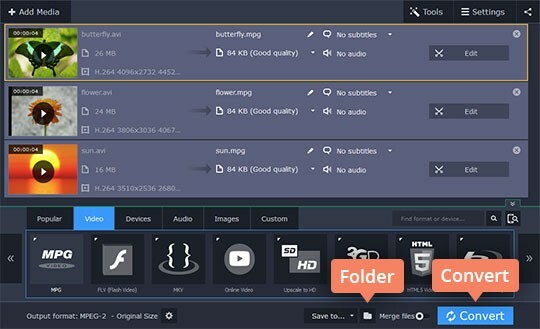 Download the video converter from the Movavi website and install it on your computer. 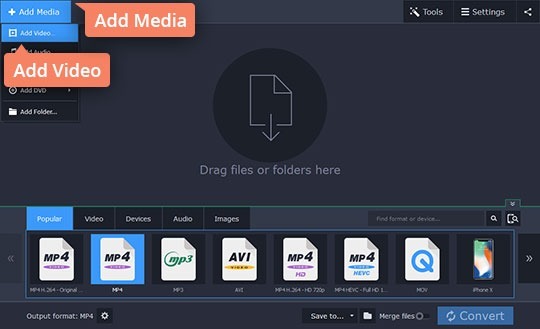 This software supports all popular media formats, so you can not only transfer video to MPEG, but also convert MPEG files (including MPG, MOD, DAT, and VRO) to AVI, MP4, WMV, FLV, AVCHD, DVD-compatible video, and other video formats. You can also extract music from your video and save it MP3, WAV, AAC, or any other popular audio format. Open the Converter and click Add Media in the upper left corner, then Add Video. Choose one or more files to convert to MPEG. 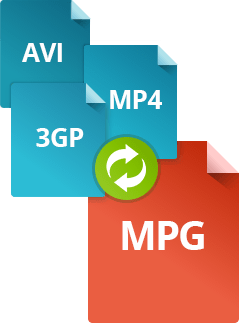 Go to Video > MPG and select the MPEG preset that best suits your needs. Click the Cogwheel icon to manually adjust the frame size, bitrate, and more, if you wish. Choose the folder in which to place the converted files by either selecting one of the available options in the Save to field or by clicking the Folder icon. Now start the processing by clicking Convert. The conversion to MPEG can take a while, depending on the size and number of your files you're converting. When the program has finished the conversion, the output folder will open automatically (unless you specified otherwise in the Preferences). Now you know how to save hard disk space by converting videos to MPEG. Change the format of your videos with ease! 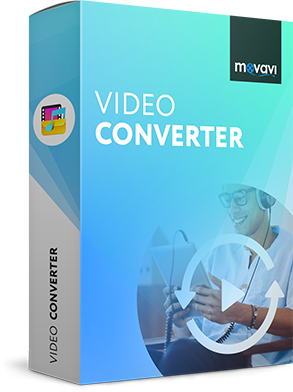 Movavi Video Converter can also be used to transfer files between dozens of other formats and save files for more than 200 mobile devices, including iPhone 6, iPad 4, Samsung Galaxy S5, and many more. 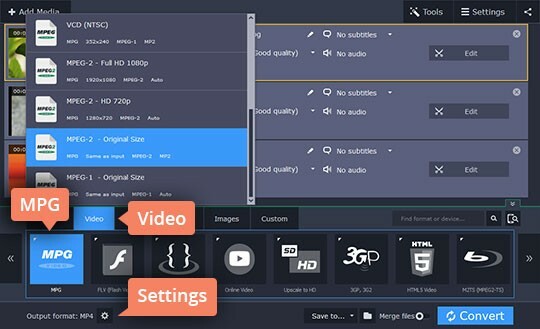 Additionally, Movavi Video Converter provides basic editing tools and enables Windows users to upload videos online using the built-in sharing application.